Lisa had her first green papaya salad at Thoa in Seattle and absolutely loved it; after trying it myself, I decided that this was something we had to make at home. The recipe itself, which I adapted from a few I spotted online, as well as what I remember of the restaurant version, came together really quickly. The biggest adventure was actually in procuring this little gadget — I wandered all over the International District/Chinatown looking for it and finally found it in a little grocery next to the Tamarind Tree. Four bucks, and the papaya was shredded perfectly. Highly recommended if you’re going to make this dish. I love how the papaya looks like noodles — so different that what I was expecting! I know, green papaya seems nothing like its ripe counterpart. I like that dishes like this are so easy to tailor to what you have on hand — you can pretty much make it however you want. Well, now that you went through all the effort of finding that little papaya shredder, we’ll definitely have to have this more often. Heck yes! Next time I’m thinking I’ll do the beef jerky version, which apparently pretty popular. Hmmm… maybe I’ll have some shrimp ready as a backup… you enjoy, though! 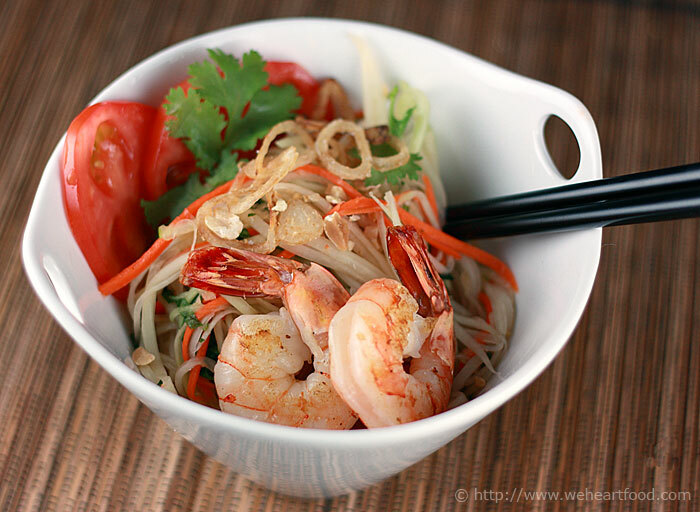 Peel the green papaya, then shred or julienne into thin strips and set aside in a large serving bowl. Peel the carrot, and shred or julienne into strips, and add to the papaya. In a mortar, crush the chilies, garlic, and sugar into a paste. Transfer to a bowl and whisk in the fish sauce and lime juice. Taste and adjust the seasonings to have your preferred level of tartness, sweetness, and spice. Pour just enough dressing over the papaya and carrots — it shouldn’t be swimming in liquid. Toss and set aside. Grill or saute the shrimp until just done, then add to the tossed salad. Garnish with fried shallots, the peanuts, cilantro, and basil. 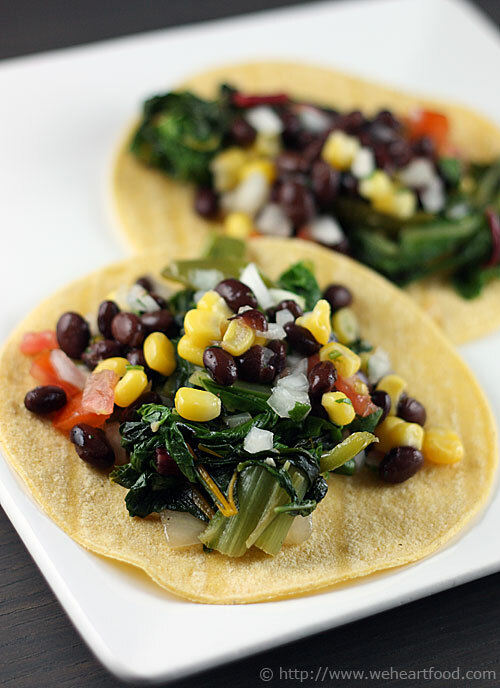 Lisa found this quick and easy weeknight recipe on the Whole Foods site and adapted it to use what we had on hand. A bunch of vegetables are stir-fried with pasta and tomatoes to recreate the flavors of a minestrone in non-soup form! 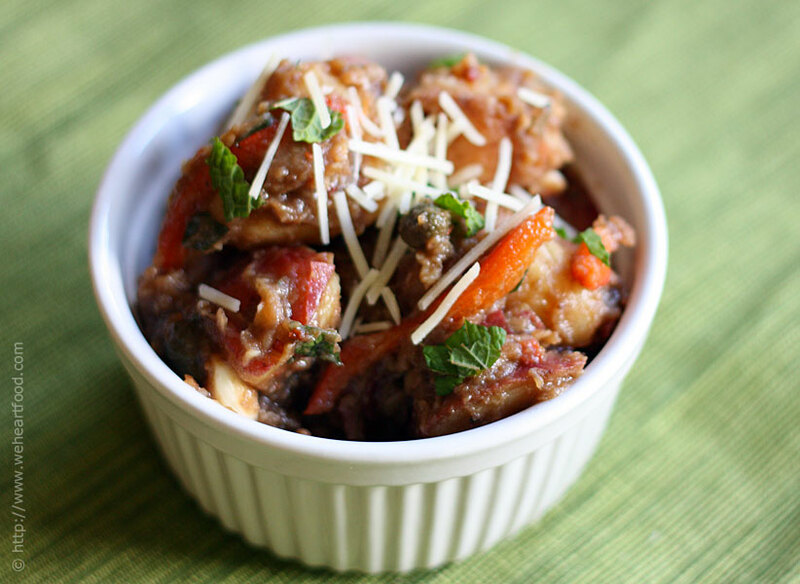 A great way to use up the vegetables in your fridge. Okay, I love this. 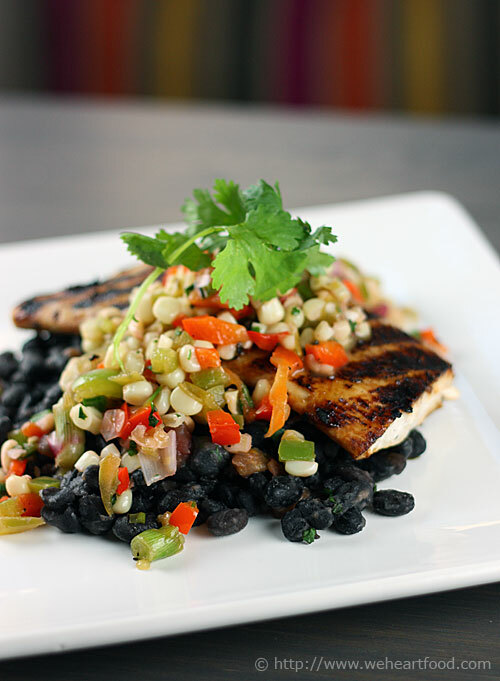 Super simple and flavorful. Really? I think it’s kind of bland. It has no flavor. Uhh… what? Is this one of those “I made it so I don’t think it’s that great? things? No, I’m serious! I just don’t think it has much taste. Well our bowls must be completely different because mine has… wait, didn’t you burn your tongue a few days ago? So I think your tastebuds are fried. Oooh, good point. Well, I’m glad you like it, but I can’t really tell how it tastes. 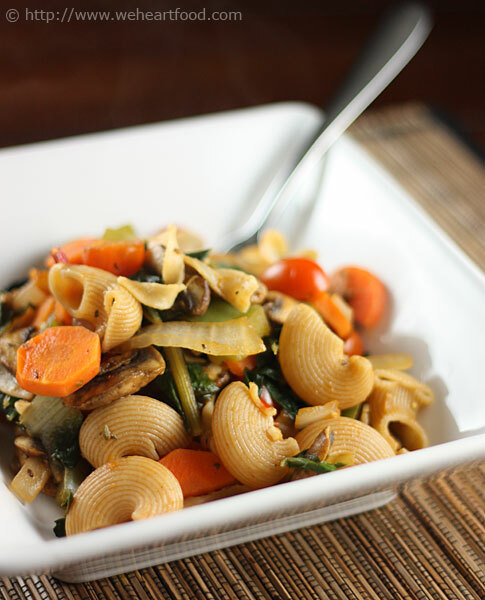 And I think it’s random that the Whole Foods site suggests you serve this stir-fry, which has pasta in it, over pasta. Okay, while you’re thinking about that and not being distracted by flavor, I’m going to finish my dinner. And possibly yours. Heat olive oil in a large nonstick skillet over high heat. Add eggplant, mushrooms, bell peppers, onions, carrots, Italian seasoning, fennel seeds, chile flakes, and garlic and cook for 5 minutes, adding a little water to prevent sticking. Add tomatoes and tomato juice and continue to cook for 3 minutes longer. Add pasta, chard, basil, and salt and cook 1 to 2 minutes longer to heat through.